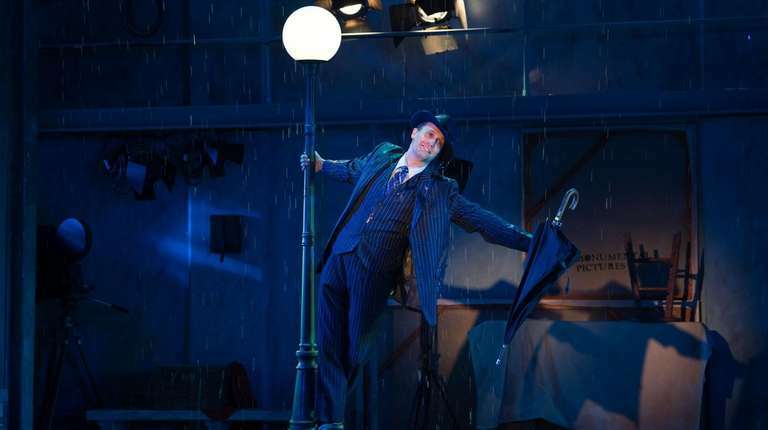 After slogging around in the rain for most of last week, the last thing anyone needed was another downpour — unless you count the deluge of pure delight that was the Act 1 finale of “Singin’ in the Rain” at the John W. Engeman Theater in Northport. Taking on the iconic role so associated with Gene Kelly in the 1952 film (talk about pressure! ), Danny Gardner put his own thoughtful spin on Don Lockwood, the silent film star caught up in the transition to “talkies.” He splashed his way through that title number in flawless song-and-dance-man style, seeming to have as much fun kicking the increasingly substantial puddles as any kid on a rainy day. The Engeman has upped its game when it comes to casting of late, and this show has star turns everywhere you look. Among the standouts: Brian Shepard as Cosmo, who truly does make you laugh in that number; Tessa Grady, walking a fine line as love interest Kathy Selden, bringing a little modern sensibility into a role that could easily be a cliché, and Emily Stockdale as Lina Lamont, the inept silent-film star who bravely manages to sustain throughout a voice so grating you could only wish for nails on a chalkboard. They all look fabulous, thanks to Kurt Alger’s stunning period costumes, all sequins and feathers that lit up David Arsenault’s soundstage set. A word, too, for director-choreographer Drew Humphrey, who not only worked his wonders with the onstage happenings, but managed to pull off a series of silent films, with the requisite shaky, grainy footage, that helped move the story along. But back to that rain. Kudos to whoever decided to leave the curtain open after the first act, allowing audience members who stayed in their seats to witness the herculean efforts involved in getting rid of all that water (wonder how many Wet Vacs they’ll go through?). First time I’ve seen a standing ovation during intermission. Singin’ In The Rain, the classic Tony nominated musical based on the wildly famous MGM film, is certainly a must see among theatre attendees. With a Screenplay by Betty Comden & Adolph Greene and Music by Naico Herb Brown & Arthur Freedes, the incarnation at Northport’s John W. Engeman Theatre will surely have you leaving the theatre with a smile. Running through July 1st, closing out the Engeman’s dazzling 11th season, the delightful incarnation is strongly directed by Engeman vet Drew Humphrey. The story, set in the 1920’s, follows silent film star Don Lockwood, charmingly portrayed by Danny Gardner, who barely tolerates his annoying and meddlesome “leading lady”, Lina Lamont, hilariously portrayed by Emily Stockdale. Laughter abounds throughout the show and we also see a budding relationship between Don and up-and-coming actress Kathy Selden, portrayed beautifully by Tessa Grady. Mr. Gardner honors the Gene Kelly role well while truly making it his own. A great voice and classic look make him a natural for the part. Additionally, his fantastic rendition of the iconic “Singin’ In The Rain”, complete with sheets of rain coming down from the rafters, practically receives a standing ovation from the enthusiastic, sold out audience. As for Ms. Stockdale, her performance brings roars of laughter. While gorgeous for the big screen, Lina Lamont’s speaking – and signing – voice is less than desirable making her, shall we say, perfect for silent films. And Ms. Grady is a fine Kathy. A quiet confidence and sass serves the role well. Indeed an audience favorite is her exquisite rendition of “You Are My Lucky Star” in addition to the well-known “Good Morning” with Mr. Gardner and and Brian Shepard who portrays Cosmo, Don’s best friend. Mr. Shepard is excellent as Cosmo who also serves as the fictional movie studio’s head musician. He and Mr. Gardner did some incredible tap numbers including “Moses” in Act One and “Broadway Melody” in Act Two. In addition to the outstanding cast, the musical direction is superbly done by Jonathan Brenner leading a fantastic live orchestra with Kurt Alger‘s gorgeous costumes enhancing the visually stunning production. Yellow colored rain coats and umbrellas adorned the cast for the big final number and it is apparent that everyone in the company is enjoying Mr. Humphrey’s energetic choreography. As you can see, everyone on the cast and creative team is truly top-notch. Indeed, you will be happily singin’ in any type of weather once you’ve seen this production. A wonderful cast, gripping story, and Long Island’s fabulous John W. Engeman Theatre prove a classic never goes out of style. The latest production at the John W. Engeman Theater will have you dancing and singing — rain or shine. “Singin’ in the Rain” premiered this past weekend to a full house and one of the most energetic crowds in past years. The classic movie, which is regarded as one of the greatest movie musicals of all time, comes to life as soon as the curtain rises, bringing the glitz and glamour of Hollywood’s golden age to Northport. It’s 1927 and Don Lockwood and Lina Lamont are the toast of Tinseltown until silent films are threatened with the rise of talking pictures. The Northport stage is set to look like an old Hollywood film studio lot. David Arsenault, the set designer, creates a simple but inviting backdrop, and many times throughout the show the sets are used to enhance musical numbers and bring even more laughs to the audience. 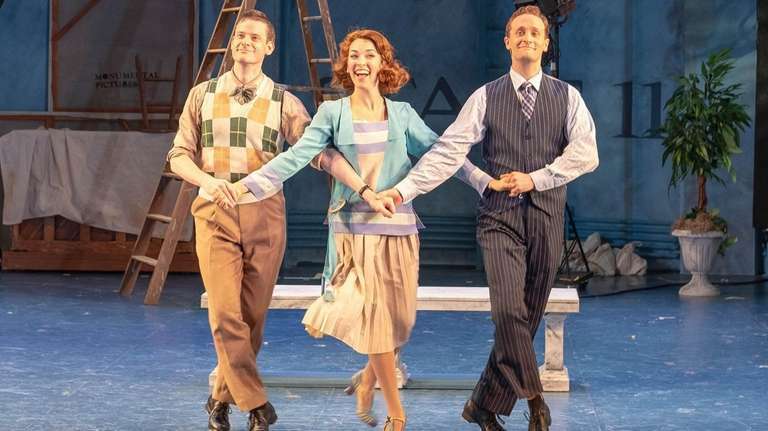 Danny Gardner, who plays Don Lockwood, brings all the magic of Gene Kelly’s iconic scene with his mile-long grin, infatuated attitude and love-struck dance moves. Perhaps the most excited the audience got was when the rain started to pour on stage and Gardner appeared in a fedora with an umbrella under his arm. Tessa Grady and Brian Shepard round out the main trio as Kathy Selden and Cosmo Brown, respectively, and the chemistry between the three is great fun to watch. Shepard brings the biggest smiles to audiences’ faces with fun jokes and a charming and lovable attitude. He steals the scene in “Moses Supposes,” and you can’t help but look for him in every scene to see what fun little moments he brings to his character. All three stars have beautiful voices, and Grady does a great job bringing her talents to Kathy Selden to make her a confident, charming character with some great comedic moments as well. Emily Stockdale as Lina Lamont and Danny Gardner as Don Lockwood in a scene from the show. Of course, the other character who delighted audiences with laughs was Lina Lamont, played by Emily Stockdale. The voice she was able to achieve for Lamont was impressive and hilarious and her short solo number in the second act was sharp and enjoyable. She brought great depth to what could’ve been a one-dimensional character. An extra fun treat for audiences was the short films inside the musical. Producer Richard Dolce and Humphrey do a great job making the film shorts hilarious, and as an added bonus a recognizable spot, Northport Village Park, makes a cameo appearance. It makes the black-and-white shorts twice the fun when you see the recognizable white gazebo as a backdrop for a sword fight and a lovers reunion. The ensemble cast who are a part of these shorts also deserve a special shout out for the delight they bring to the small screen. Musical Director Jonathan Brenner handles the numbers wonderfully, bringing all the right emotion each scene calls for. “Moses Supposes” excels not only for Shepard’s lovable conviction but also the way Brenner handles the music. The same can be said for “Good Morning.” This scene delivers on all the fun the original film brings, and although the characters aren’t trotting together from room to room, this production’s version encapsulates all the charm. And even with all the fun, this production saves the best for last with a closing number you won’t want to miss. Kurt Alger, costume designer for the show, adds an extra pop with costume choices for the end, bringing extra color and fun to the stage. But, of course, the elegant period pieces in the show’s entirety are also a marvel to see, especially a French-style costume worn by Stockdale. With more than just fan favorite songs, this musical promises to deliver a fun-filled evening for all who attend.